Green bananas, anyone? Dr. Seuss would be pleased. Unripe bananas are rich in a type of starch called “resistant starch,” which naturally resists digestion and is an insoluble dietary fiber. Because freshly harvested bananas have a starch content of 70-90% and are low in sugar, they’re ideal for millage into non-clumping powders that can replace wheat or rice flour, malodextrin, corn or potato starch xanthan gum, sugar and other ingredients. One start-up ingredient technology company is harvesting the opportunity to use green bananas to please the taste palate while offering the nutritional benefits of potassium and magnesium. The flours can replace sugar by replacing bulk, as noted by foodingredientsfirst.com. They provide texture and labeling opportunities different from those available from corn, potato, tapioca and other traditional starch starting points. International Agriculture Group (IAG) produces the green banana flour, of which they are two types: NuBana100 and NuBana500. The products contain no gluten and both work well in gluten-free applications. The flours can replace high glycemic ones like rice and potato flour, and may eliminate the need for binders and other hydrocolloids, resulting in better nutrition and clean labels. It also contributes softness and flexibility in gluten-free applications, the company says. Witwer says about 15 grams of NuBana N100, which equals a ½ fruit serving, delivers the processing benefits of a cook-up starch with high viscosity. NuBana P500 is a pre-gelatinized flour that thickens in cold water and can replace hydrocolloids and stabilize fruit systems. 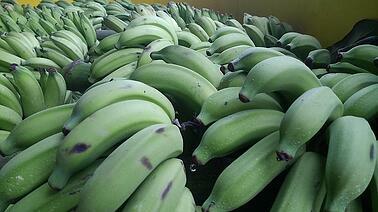 Harvested green bananas typically have a starch content of 70-90%. As they ripen, that starch is converted into sugar. When they reach the grocery bins in the United States, most bananas contain about 15% starch. According to Moragne, several manufacturers are working with the product to launch commercial products made with the flours later this year. BCC Research’s newest report on the global market for flavors and fragrances estimates it to grow from $27.1 billion in 2016 to $37.0 billion by 2021, thanks to a projected 6.4% CAGR.